Santa Rosa Tattoos & Blues takes place Friday–Sunday, Feb. 23–25, at the Flamingo Conference Resort & Spa, 2777 Fourth St., Santa Rosa. Doors open at noon each day. $15–$30. santarosatattoosandblues.com. GIRL WITH A LOT OF TATTOOS The 27th annual Tattoos and Blues festival will showcase a who’s who of American tattoo artists. 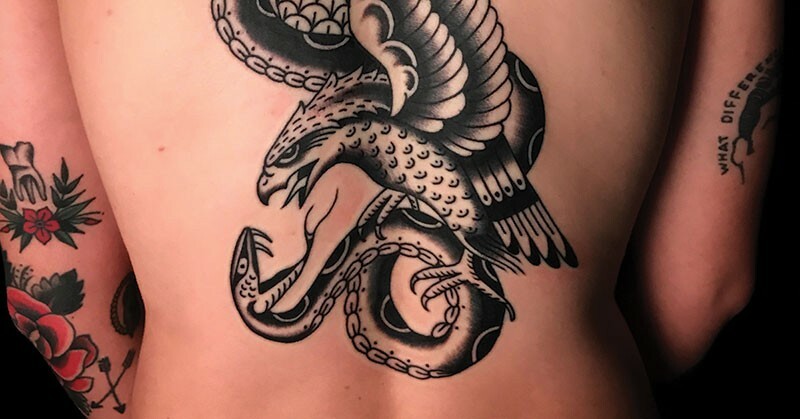 Ever since Ukiah-raised Norman "Sailor Jerry" Collins began poking his fellow Navy men with an electric needle dipped in ink back in the 1930s, tattooing has become a time-honored form of expression for Americans who want to turn their bodies into living works of art. In the North Bay, tattooing's biggest stars have gathered every year since 1992 for the annual Santa Rosa Tattoos & Blues event, the longest continuously running tattoo expo on the West Coast. But that streak was almost broken this year when the event's previous owner wasn't able to commit financially to the show. That's when longtime friends and third-generation Santa Rosa natives Daniel Dorsett, owner of Dorsett Speed Shop, and Daat Kraus, tattoo artist and owner of Santa Rosa Tattoo, stepped in to run the show themselves. "We didn't want to see it end," Kraus says. "The history of the show in the tattoo industry is huge," Dorsett says. "We're trying to keep the tradition alive." This weekend, Santa Rosa Tattoos & Blues returns for its 27th consecutive year, presenting three days of live music, top-quality tattoo artists and new highlights. Dorsett and Kraus have revamped every aspect of the show, starting with the roster of over 200 artists who will be on hand. "All the artists are big names in the industry today," says Kraus. "They're all the best, the ones on top of the game of tattooing." Artists attending this year's event include Theo Mindell, from San Rafael's Spider Murphy's Tattoo; Joe Leonard, who made his name in Santa Rosa when he opened Monkey Wrench Tattoo Shop in 1995; Reno-based artist Ron Rash; Sonoma's Shotsie Gorman; and the event's original founder Bert Rodriguez. Other artists on hand represent shops near and far, including Santa Rosa's Faith Tattoo and Avenue Tattoo, Cotati Tattoo, Napa Valley Tattoo Company, San Jose's State of Grace Tattoo Shop and Anaheim's Good Time Charlie's Tattooland. The three-day event is also mixing up the music. While local blues acts like the Aces and the North Bay Blues Rock All-Stars headline Friday and Sunday, Saturday hosts rockabilly bands like the RevTones to accompany the event's car show, featuring dozens of classic hot rods from South of Heaven Filthies Car Club and North Bay Impalas Car Club. Sunday also includes a tattoo contest to recognize the best, most colorful or most unusual body art. "It's going to grow, it's going to get bigger, but we'll never jeopardize the integrity of the show," Dorsett says.